I had the luxury of being agnostic. When I began Brazilian Jiu-Jitsu some two decades ago MMA was nascent, and it was beyond my horizon. I spent close to a year practicing pure Brazilian Jiujitsu 4-5 days a week, 2-3 hours a day. Having achieved a blue-belt ranking I learned just enough to fantasize that I was on the cusp of mastery. Immersing myself in a pure discipline without the benefit or hindrance of other disciplinary interference allowed me to pour a solid foundation, both psychological and physical, for what would metamorphosize into MMA. Relative youth was on my side, injuries hadn’t yet started to accrue, and my mental bandwidth wasn’t maxed out with memory demands of other sub-disciplines. It might have been wrestling, it could equally have been boxing. The gateway discipline itself didn’t much matter. In retrospect, the confidence gained in pursuit of a solitary discipline was a gateway to MMA in and of itself. It’s emotionally comforting to have a disciplinary fallback when competing in a multi-forum sport. To be sure, in assessing myself as on the cusp of mastery, I was naïvely mistaken. I was nowhere close to mastery of Brazilian Jiu-Jitsu, but this is one of those rare instances when ignorance is a blessing. I was probably the better for not knowing the lowly rung I straddled on that telescoping ladder. As an instructor of mixed martial arts with close to 20 years of experience and a reasonably sound corpus at 43 years of age, I am afforded a type of venerated status-if for no other reason than I haven’t been retired by injury! As such, I feel qualified to field the question, “What classes should I take if I want to become a mixed martial artist?” People learn differently. Some are auditory learners. Some are visual learners who do better to focus explicitly on a solitary discipline for an extended period of time. Others prefer to spread their attentions across multiple subjects. Having said that, allow me to dovetail back into my opening paragraph. Assuming that you are posing this question, there was something that drew you to the sport. Is it the idea of intensely focused fitness as opposed to what you earn during a mind wandering treadmill run? Pad rounds and/or sparring will likely yield comparatively better cardiovascular results with the corollary benefit of learning a martial art. And then there’s a cogent perception that you are vying for self-preservation. It has a way of inspiring maximum effort. If it was kickboxing that seduced you, is it the incision-flare of that final kick in combination. Is it the blunt destructiveness of a low kick to the leg and the awkward step down with which your opponent betrays himself as he attempts to reclaim his stance? Was it the elegant manipulation of space and distance? Is elusiveness your shrine? Perhaps you’re taken by the grinding endurance-mental, physical, emotional? Perhaps it’s the complex dynamic problem-solving? Whatever the case may be, I would recommend focusing your initial energies on that original seed of inspiration. There’s a learning progression that optimizes one’s development. Start with the mechanics of basic movements-the building blocks-the fundamental choreography of how to execute the number one or number two punch, which is a lot more like mastering a golf swing than many would probably care to admit. Perhaps next we would learn to string such punches together in combination, i.e. #1,2 one of the most powerful combinations in Boxing. However before effectively delivering strikes to a target comes the ability to move in stance with footwork and proper distance positioning. From a purely practical standpoint it makes sense for a new student to practice footwork drills and shadowboxing without any punches until a threshold of competency is met. Yet a practical approach doesn’t always yield the intended growth because mind numbing repetition can extinguish inspiration-the inspiration that brought you into the gym in the first place. It can be an uphill battle to convince somebody who is enamored with fists hitting faces that how she steps with her jab should be the current focus of development. I tell my students to pursue their passion. Study what interests them. The conception that they have of what it is that they will be doing will be satisfied or changed as they journey toward their destination. A student might be satisfied to hit pads with a certain ferocity and clip, or she may quickly come to realize that the sport offers a value beyond that which she was able to view from the starting line. Suffice it to say, nurture your interest and passion at the outset. If you truly want to learn the “sweet science,” you’ll likely come to that realization somewhere along the double digit mile markers. You might rearview a few gyms along the way. If and when you embrace competition and the grueling nature of the sport comes to fore, the person who chooses that path will be handsomely rewarded with the hard to earn virtues of discipline, perseverance and humility to name but a few. Convincing the nascent student to practice footwork patterns is a fool’s errand and stifling to creativity to boot. Once you as a student have gained some experience, as with anything, you’re in a more informed place to revise or move forward toward your goal. If your original inclination doesn’t now warrant revision, I recommend immersing yourself further in your current subject, and I recommend beginning to attend classes in the other mixed martial arts disciplines offered at your school so that you can begin to acquire the building blocks to round out your skill set. Use your judgment in deciding the optimal study ratio for yourself, but I recommend allocating at least one third of your time to classes outside of your current wheelhouse at the outset. If you’re truly married to the idea of becoming a mixed martial artist, then invest intently in your passions and attend with regularity the other classes essential to meet your goal. Your unique passion for one discipline may spill into other disciplines or you may come to the realization that you do prefer a particular sport over the others. Maybe you are enamored with submission wrestling, or you enjoy striking, but kicking is not your preference. As far as quality of life is concerned, and here I freely admit my hedonistic bias, allow yourself to enjoy that which draws you. You will not be closing any doors in doing so. In fact, I found myself studying things in later years that I never expected that I would. And inspiration often sustains in violently challenging times. 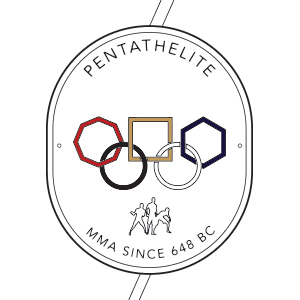 The Ludusport Pankration discipline consists of five primary disciplines although we gladly help ourselves to extracurricular techniques as well where necessary. Boxing, kickboxing, thaiboxing, submission wrestling and wrestling inform the style. There is a natural learning progression as one moves from boxing, with the two fists as weapons, to Dutch style kick-boxing, which incorporates shin strikes to thaiboxing, which further includes elbows and knee strikes. Each one of these disciplines features many world champion adherents who have spent a veritable lifetime mastering their specific craft. Thus the problem of the mixed martial artist, i.e. the mastery of (at least or at most) five disciplines, each highly refined in their own right, integrated into a practical combat form. If you have the discipline and emotional intelligence quotient of a robot and you are dead set on becoming a mixed marital artist, I would advise that you adopt the following regimen at the outset. Attend classes in boxing, wrestling and submission wrestling concurrently. ***** As you progress, substitute kickboxing for boxing, etc. Once you’ve acquired the building blocks, begin to develop an interdisciplinary style. In other words, I don’t recommend that you dive into MMA class on the first day if your intention is to become expert at it. Acquire the tools. Collect the building blocks. Then start to erect a multi-disciplinary edifice that is engineered for an uncertain future. In summary, if you grew up in the 70s like I did, I probably sound like your parent-follow your passion. “Mixed Martial Arts” is a broad stroke, and options abound. You needn’t compete in order for the brush to pass your brow. You needn’t define “MMA” as boxing plus thaiboxing plus submission wrestling plus wrestling plus steely eyed ruthlessness! There are people who can clearly be called mixed martial artists who have extensive karate backgrounds and basic wrestling skills to name but one mutation. It is safe to say that it is essential for the contemporary mixed martial artist to develop a skill set that includes striking, transition fighting, and ground fighting if you harbor ambitions of competing in the average forum. But honestly, that’s only just my considered opinion. Ask Elon too! “MMA” has often, although not always, become an advertising buzz-word to entice students into gyms, dojos and “kickboxersize” stations for the benefit of monetary conversions. Again, the term MMA is such a broad category that people can mean anything by it, which pretty much renders it inert in its ability to define what a gym teaches. You’ll need to do some unpacking. The term, when used surreptitiously, does a good job at slight of hand. Gyms, traditional and otherwise, that invoke the word, are often attempting to stave off market obsolescence in 2018. To be sure, everything moves in cycles. *****Pure wrestling can be very hard on the body given the full body spasms required to avoid being taken down. When two novices partake, one of them could end up maimed or at least with a disinclination to tempt fate again. That’s not a good look for a once eager student. Begin slowly, and keep it technical at the outset. You can’t make progress if you are unable to train due to a dislocated shoulder or broken wrist. How you drill and spar is one of the single most important habits that you will undertake. Treatment of that subject is beyond the scope of this article, but I will bracket it for future discussion. *****Submission Wrestling doesn’t have a straightforward, linear learning format. If you know how to submit an isolated arm from side control position with a Kimura, but you don’t know how to pass guard, it is practically useless for sparring situations in which your goal is a submission…unless, of course, you possess a shiny new elevator sweep or the like…which illustrates my point. Proficiency in submission wrestling requires competency in attacking and defending on so many fronts that the pursuit of mastery is more like filling in the pieces of a jigsaw puzzle. You will go thorough a period of time in which you are gathering a myriad of techniques: a submission here, a guard pass there, a sweep, a reliable guard pass, an outside heel hook, etc., and then all of a sudden one day you reach a type of developmental critical mass. It will be a DNA hybrid admixture of your predilections with that of the club(s) that you frequent. As time and radiation prevail, you will mutate further. In the meantime, build your skill sets one step at a time, and “roll” responsibly. Tap early and often, as you will literally be ill-equipped to submit higher ranking practitioners for some time. There is no shame in conceding in the face of an overwhelming technical assault, or plus 50 lbs, or both! *****The striking progression is fairly intuitive. You learn a stance, and how to preserve that stance as you move. You then layer in higher order defensive techniques and punches. You start to develop footwork patterns and combinations. The number of striking techniques is few in comparison to the submission wrestling repertoire. This isn’t to say that mastery happens more rapidly for the boxer. On the contrary I personally think that mastering a limited number of striking techniques is, in certain salient ways, more difficult then adding another new submission to a sprawling arsenal. *****Here is where I take occasion to remind you that learning mixed martial arts is not a binary proposition. It is not either that you’ve learned a given technique or you haven’t. Think of it as a spectrum of development if you like, and this development will entail an ongoing process of refinement. It’s a humble and lofty goal to simply improve. A higher order problem concerns itself with weaving these discrete disciplines together into something that is organic, practical and formidable. The knit fabric becomes a woven fabric, and the holes microscopic. The science produces a more refined, semi-permeable membrane. It becomes, for all practical purposes, like a skin. “Biotechnical Practitioners” we are.